Goulash is a soup or stew chock full of meat, noodles, and vegetables that comes out of Hungary. The anglicized name goulash is derivative of the Hungarian word gulyás, which means “herdsman.” This dish is representative of what Hungarian cattle herdsman might make to eat while they were out on the range. And that means that this hearty dish is essentially an eastern European cowboy stew. For centuries, spanning from the Middle ages through to the 19th century, Hungarian herdsmen from the Puszta region drove portions of their great cattle herds to Europe’s biggest cattle markets in places like Vienna, Venice, Moravia and Nuremberg. Along the way, they slaughtered one of their herd to eat, and portions of the carcass no doubt made their way into this spice-filled stew. When these herdsmen brought their cattle to market, they impressed a lot of people along the way. Many in the surrounding countries and on the path to market began to make goulash or goulash-style recipes. It became a popular meal in Austria, Bosnia, Croatia, Germany, Lithuania, Poland, Italy, and the Netherlands, among others. And though goulash is eaten all over Europe, it’s proudly held as a national dish in its native Hungary. 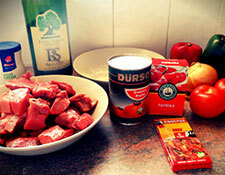 Since it has spread, goulash has taken on various different ingredients, according to the region. It can have a base of beef, veal, pork, or lamb. Often, cuts from the shank, shin, or shoulder are used and the goulash gets most of its thickness from collagen rather than flours or other thickeners. 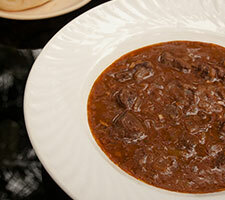 The meat is cut into chunks, then browned with sliced onion and then simmers in water or stock with paprika. Once the meat is tenderized, vegetables and spices go in the pot. When all of the flavors have married and the ingredients are cooked through, it’s all served up with a starch, often a bed of egg noodles. Grab the Paprika and Get Cooking! Are you hungry yet? Great! Here’s our take on dutch oven goulash! Preheat Five Quart Dutch Oven to 325 degrees. Brown beef tips and onion in oil. Add whole tomatoes, mushrooms and seasonings. Cover and simmer 1 and a half hours, until meat is tender. Stir occasionally. Blend flour and sour cream. Gradually stir into meat mixture. Serve on noodles or macaroni. Have you tried this recipe? Do you have your own version of this hearty, pioneering dish? Tell us how you make goulash in the comments below! This recipe comes originally from the Dutch Oven genius at dutchovendude.com. Thanks! I have read so many content regarding the blogger lovers however this piece of writing is in fact a fastidious paragraph, keep it up.